In light of Halloween I am going to do several, darker themed posts including photography, some experiences and some artwork. I decided today to try my hand at some indoor photography, experimenting with what little lighting I have and objects around what we call in my house-share ‘The Snug’. To the untrained eye it is but a shed, but to the people who understand the intricacies of the rules, events and awards; it is much, much more. I intended to be somewhat controversial on this one. 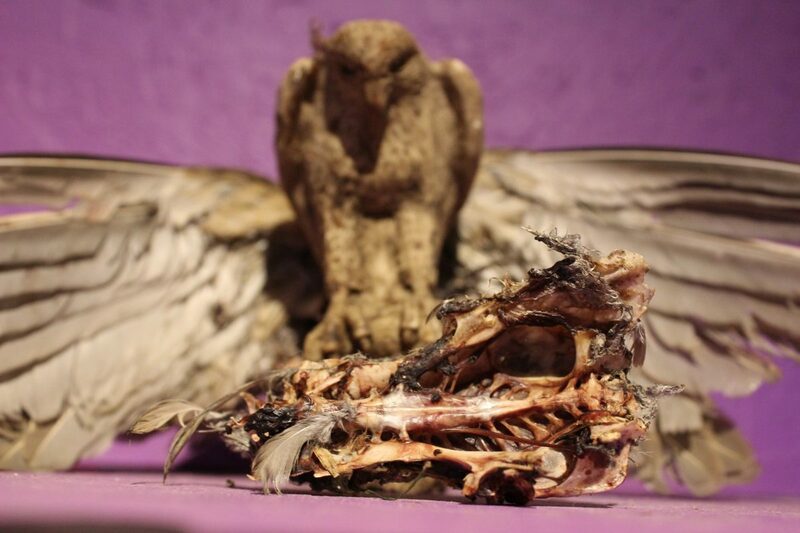 Rarely do you find people who actively seek out images of dead birds. I felt compelled to make it upon finding the already deceased pidgin at the end of my garden when searching for apples for a different photo I originally planned to take. I find the detail within the sternum mesmerizing, the out of focus statue menacing and the protruding wings add an air of impending doom, as though it was about to pounce. I enjoy the business of this image, the cold stare of the statue with the overseeing vulture ominously perched above it makes me think of loss. An additional image that is not of the same theme but I thought I would share. I took this in the heart of Coventry city, a small patch of vibrant colors in a realm of block grey and industry. The display sports a vast spectrum of different color flowers, I found this small collection of dying ones in the centre of it. Much like the display itself, these stands out as the odd one out, this time the less beautiful surrounded by perfection. Even beauty has its dark side. So what did you think of these? I would love to hear any and all feedback! “Beautiful Decay” caught my eye immediately. I love it. Thank you, thats great to hear! It was a burst of inspiration that I felt compelled to act upon. Truly art’tistic… I love it! This was a post that got me thinking.